On a budget? Spent your gambling allowance? Low funds doesn’t have to equal no fun! 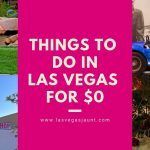 Check out our exciting list of Las Vegas attractions available for free!